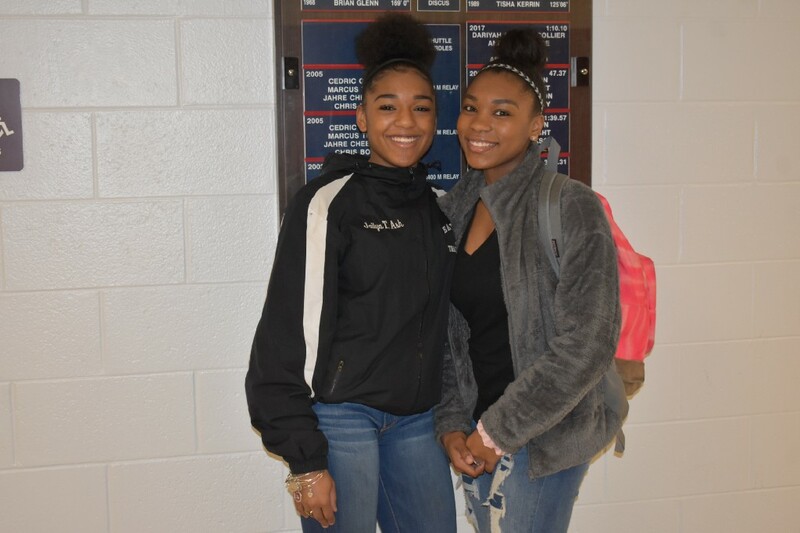 Sophomore Jailya Ash became a state champion in the 55-meter dash, while junior Jewel Ash placed in the top five in both the 200-meter and 400-meter run. Eastern Regional High School sprinters and sisters Jailya and Jewel Ash have a sibling rivalry unlike any other. The sisters run a lot of the same sprint and hurdles events, and whenever the two line up in the same race, it’s on. “When we do run against each other, it’s a race,” Jewel said. However, the moment that best sums up Jailya and Jewel’s relationship took place at the NJSIAA Meet of Champions on Feb. 24. Jailya was running in the finals of the 55-meter dash against some of the fastest girls in the state, such as Dennisha Page of Woodrow Wilson High School and Lauren Princz of Egg Harbor Township High School. Jailya just barely beat Page with a time of 7.14 seconds and became the first Eastern athlete to win a indoor Meet of Champions event since English Gardner, one of the Vikings’ all-time greatest athletes and a 2016 Olympian. After crossing the finish line, Jailya didn’t immediately realize she had made history. Instead, it was Jewel who let her know. The indoor Meet of Champions was a special event for both Ash sisters. Not only did Jailya win the 55-meter dash, but Jewel placed fifth in both the 200-meter and 400-meter runs, capping off an outstanding winter season for both girls. Reaching the Meet of Champions was a high point for Jewel, a junior, and Jailya, a sophomore. It was the first time either sister had qualified for the indoor event, making the afternoon a special one for both sisters. While there’s a lot of bonding on the track, Jewel and Jailya are not shy to talk about the rivalry existing between them as well. Both girls run the same sprint and hurdle events. Jewel’s stronger events are the long 200 and 400-meter runs, while Jailya has become a force in the shorter 55-meter dash in the indoor season and 100-meter dash in the spring. It’s rare Jewel and Jailya race each other in competition. Jackson normally doesn’t put both of them in the same event until the sectional and group meets, when Eastern is trying to accumulate points to win a team championship. Jackson added he believes the sibling rivalry benefits both sisters. “From a coach’s standpoint, I don’t mind it, because it makes each of them better,” he said. The relationship between Jailya and Jewel includes bit of everything. Jailya admits the two have their fair share of arguments, while Jewel described Jailya has a very unique person. Beyond the sibling rivalry, there’s a lot of love between the two. Both sisters cheer each other on at meets and offer encouragement to one another. At the Meet of Champions, it was Jailya’s turn to cheer first as Jewel kicked off the day for the Ash family with the 200-meter run and 400-meter run. In both events, Jewel ran personal best times and finished in fifth place. The only thing Jewel was disappointed in was a race she had won the previous week at the NJSIAA Group 4 Championships. Jewel won the 400-meter run at group championships with a time of of 58.46 seconds, but noted the time was slower than in other groups. Her time placed her in heat four at the Meet of Champions instead of heat five with the other top contenders. Despite this, Jewel ran a much better time at Meet of Champions, clocking in at 57.76 seconds. Later in the meet, the sisters reversed roles as Jailya headed to the starting blocks for the 55-meter dash. Jailya was also looking to improve her performance after finishing in fifth place at the Group 4 Championships. Jailya’s Meet of Champions’ winning time of 7.06 seconds ended up being more than three-tenths of a second faster than the 7.37 seconds she ran the previous weekend. Both sisters are already making their marks on Eastern history. Jewel already owns the school records in the 200- and 400-meter runs. Jailya wants to join Jewel in the school record book. She is hoping to take down Gardner’s school record of 11.49 seconds in the 100-meter dash this spring. With both sisters sharing a strong work ethic and a desire to continue improving on their times, it’s likely the track and field community will keep hearing about the Ash sisters this spring. “There’s no ceiling on what they can do,” Jackson said.